The surrounding Cafetero region is so green and lush. In an effort to bring you some of the most vibrant and captivating family vacations around, we present Colombia. Set amidst the striking backdrop of the Andes Mountains and bordered by the warm waters of the Caribbean Sea, it’s a country bursting with colonial charm, aromatic coffee plantations and silky-soft white-sand beaches. But it doesn’t stop there, Colombia also has plenty more in store that kids and adults alike will love. Whether you’re looking for a fright with spooky tales in Bogota or crafting the perfect bar of chocolate in Cartagena, this eight-night family discovery ticks all of the boxes. 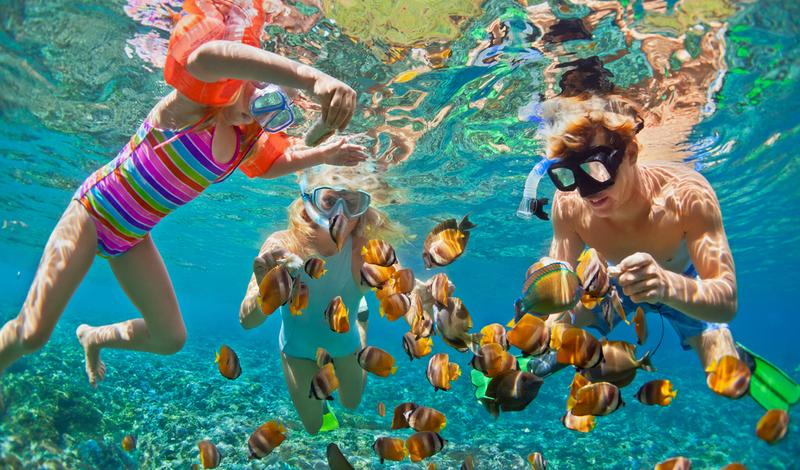 So grab the kids for a whirlwind getaway where you’ll marvel at the colors of Cartagena, horse ride through the depths of lush jungle and snorkel the afternoons away in the sparkling waters of the Rosario Islands – all before an epic finale in the cosmopolitan city of Bogota. Begin your Colombian adventure in Cartagena, a coastal city most well-known for its bright facades, fresh seafood, and proximity to beautiful islands. After checking into the city’s most luxurious hotel, Casa San Agustin, spend the afternoon exploring this enchanting city at your own pace. The entire next day will be spent on the Rosario Islands. Just one hour from Cartagena, these islands are considered to have the most diverse marine life in Colombia. Spend the day snorkelling, lounging on shaded hammocks, playing beach volleyball, and cruising between islands. After satisfying your island craving, it’s time to explore the culture of Cartagena. One immersive afternoon will be spent with an expert in Colombian cocoa. Following a short lesson about the process of making chocolate, you’ll be ready to make your own. Choose between dark, milk, or white, with plenty of fun ingredients to add. Your last morning in Cartagena will be spent on a private tour of old town, learning about Spanish colonizers and pirates, while recounting the stories of iconic fortresses, plazas, and colonial mansions found along the way. Welcome to Cafetero, Colombia’s lush coffee and jungle region. Upon arrival, check into Casa San Carlos Lodge — a luxurious hotel in the heart of Pereira. Thanks to the elegance and comfort of Casa San Carlos, an effortlessly restful night will prepare the entire family for the action-packed following day. The mornings trekking expedition will lead you to secluded waterfalls and past grand viewpoints. You will experience the picturesque valley of 60-meter high palm trees and hike through a hypnotizing cloud forest, stopping to visit an exotic bird sanctuary. Once you’ve worked up an appetite, you can choose from one of the many quaint cafes in Salento. This UNESCO World Heritage site is a traditional pueblo located in the Andean countryside. Wander these magical streets at your leisure, making sure to stop for a round of Tejo – a popular Colombian street game — with the local village people. Begin the next day with a swim in the Casa San Carlos outdoor pool and walk around their expansive garden. 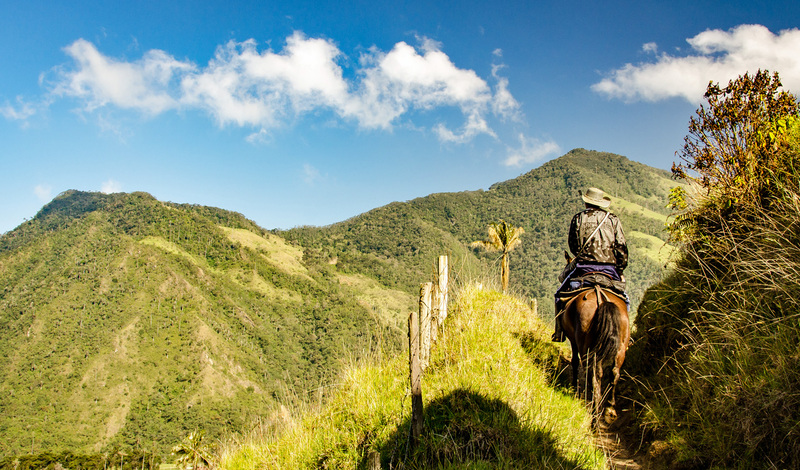 This afternoon, set out on an epic horseback riding adventure through fragrant coffee fields. This private excursion is a once in a lifetime way to marvel in the regions natural beauty and is sure to be a highlight for all ages included. By days end, it’s time to move onto Bogota, Colombia’s lively capital. No trip to Colombia would be complete without a stay in Bogota, especially at the historical Casa Medina Four Seasons. Awarded monument status by the Ministry of Culture, Casa Medina is luxury at its finest. Your first day includes two exciting tours, the first of Bogota’s Gold Museum. You’ll learn the country’s history of gold-mining and the significance of some extraordinary pieces. Afterwards, a private expert will guide you through a thrilling ghost tour of Bogota’s La Candelaria neighborhood. Hear spooky and fascinating stories behind Bogota’s most famous cathedrals, plazas, and monuments. Fret not, it’s very suitable for all children. Already dazzled by the cities magnetic energy, your last morning will be spent seeing the city from a bike. An expert will recommend ideal routes to absorb an abundance of Bogota’s diversity and architecture. Continue onto the quirky Usaquen neighborhood, well-known for its artisan boutiques and vivacious markets. Stock up on Colombian souvenirs before bidding Colombia farewell the following morning. It’s been an incredible week exploring Colombia’s best regions with treasured memories of dense rainforests, street-side salsa, fresh cuisine, and azure waters – the absolute family trip of a lifetime.